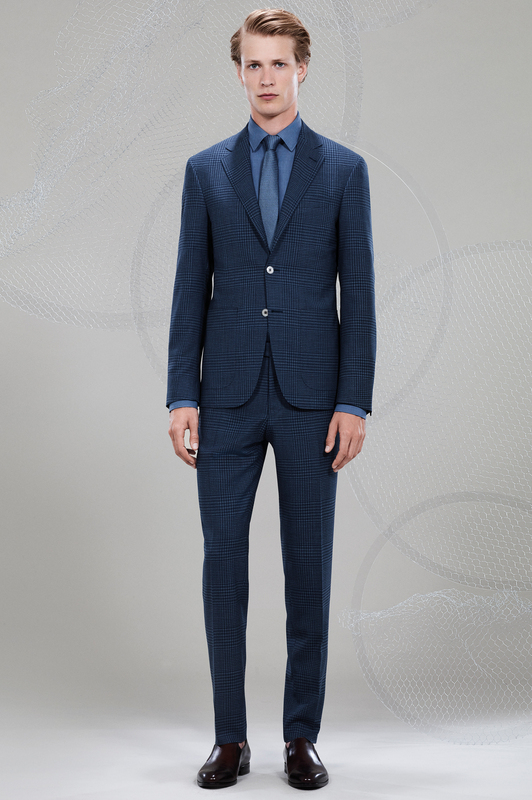 Impeccabile 2.0 pure wool Kei suit with macro Prince of Wales check; two-button blazer, two pockets, applied pocket and flat-front pants, slim fit linen-cotton shirt, unlined silk tie with contrasting stitching, cotton-linen mélange tie, calfskin loaders with medallion. 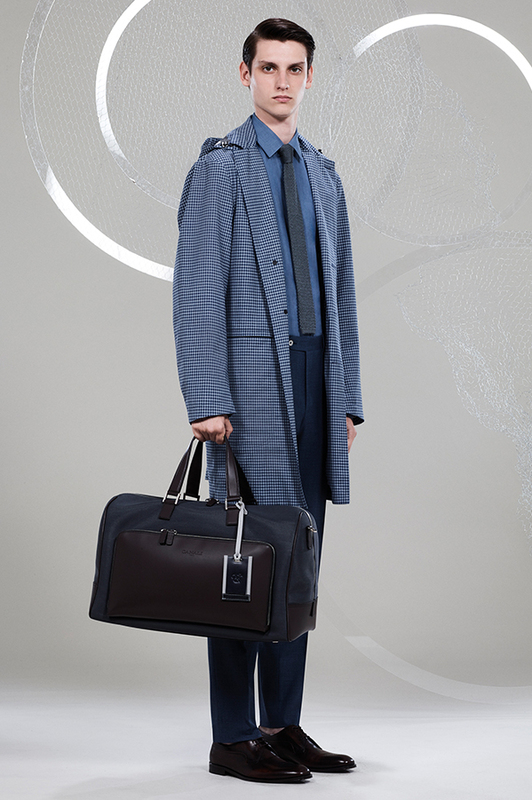 Pure wool Impeccabile 2.0 sport coat in Rain and Wind technical fabric with Prince of Wales check, horizontal zip pockets, removable hood, cotton sweater with vertical ribbing and trapeze collar, Impeccabile 2.0 wool Kei flat-front pants, calfskin and fabric sneakers, backpack with two belts, zip and side pockets in tumbled calfskin and Impeccabile 2.0 fabric, two-tone name tag. 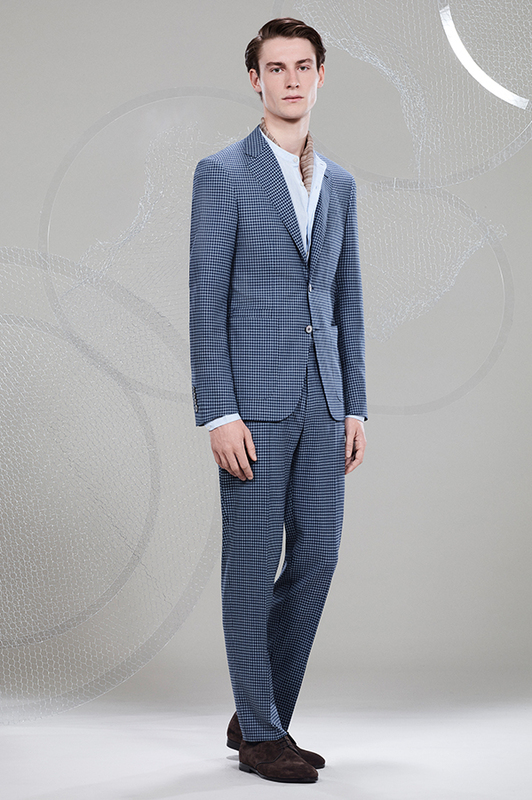 Pure wool Impeccabile 2.0 Kei two-button suit with micro-checks, flat-front pants with tapered leg, linen collarless overshirt with pockets, suede Derby shoes, cotton-linen scarf. 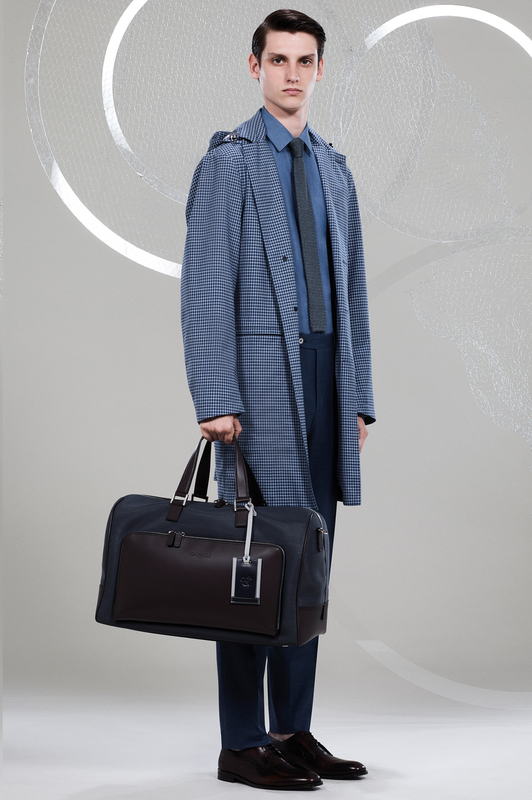 Impeccabile 2.0 pure wool sport coat in Rain and Wind fabric with checks and removable hood, slim fit linen-cotton shirt, pure wool Impeccabile 2.0 flat-front pants, knit silk tie, calfskin Derby shoes with medallion, calfskin and technical fabric weekender, two-tone name tag. 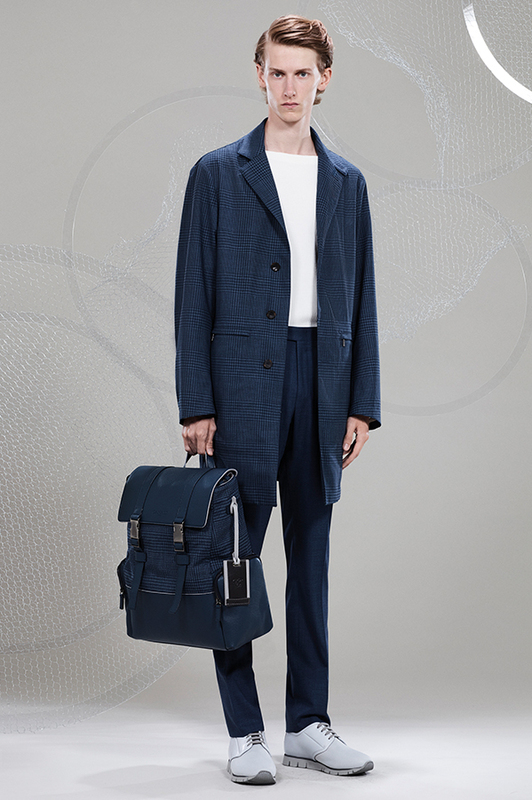 Pure wool Impeccabile 2.0 semi-lined rain coat, cotton crew neck sweater with horizontal ribbing, mercerized cotton T-shirt, linen-silk double-pleated pants, suede Derby shoes, calfskin and fabric backpack with zip and front pocket. 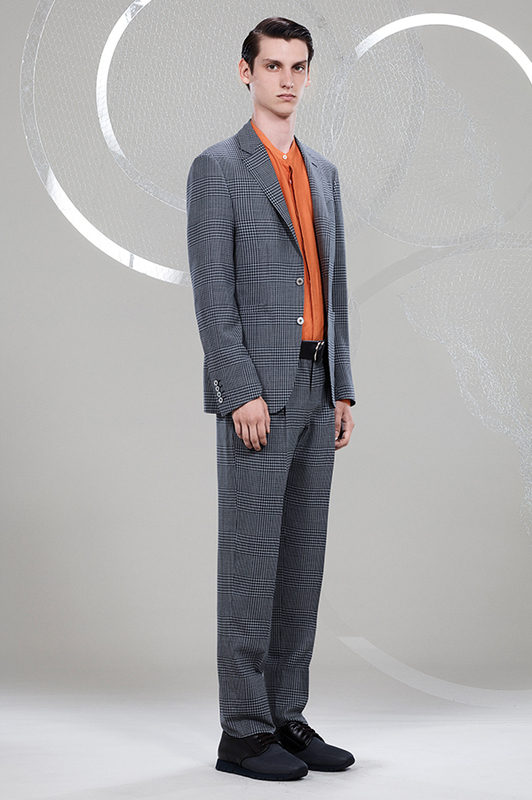 Pure wool Impeccabile 2.0 suit with micro-chalkstripes consisting of two-button blazer and flat-front pants, cotton sweater with vertical ribbing and trapeze collar, long calfskin belt with double rings, suede calfskin Derby shoes, cotton-linen scarf. 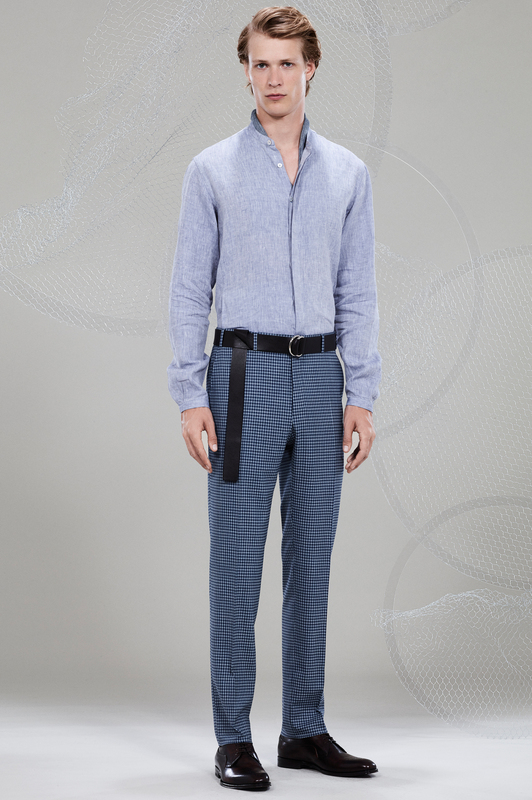 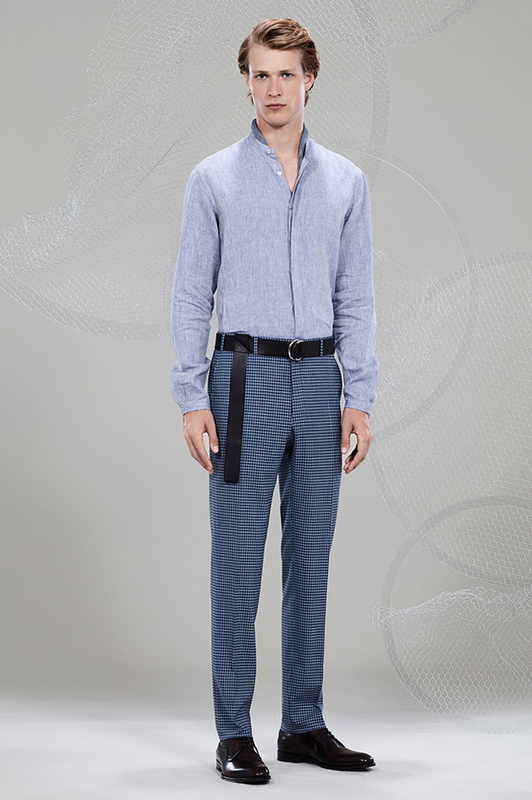 Linen collarless overshirt with pockets, pure wool Impeccabile 2.0 Kei flat-front pants with micro-checks, long calfskin belt with double rings, cotton-linen scarf with denim effect, calfskin Derby shoes with medallion. 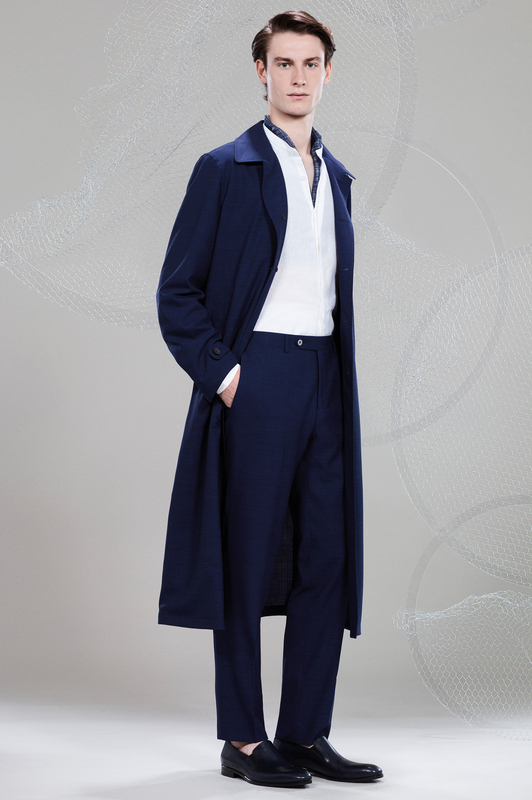 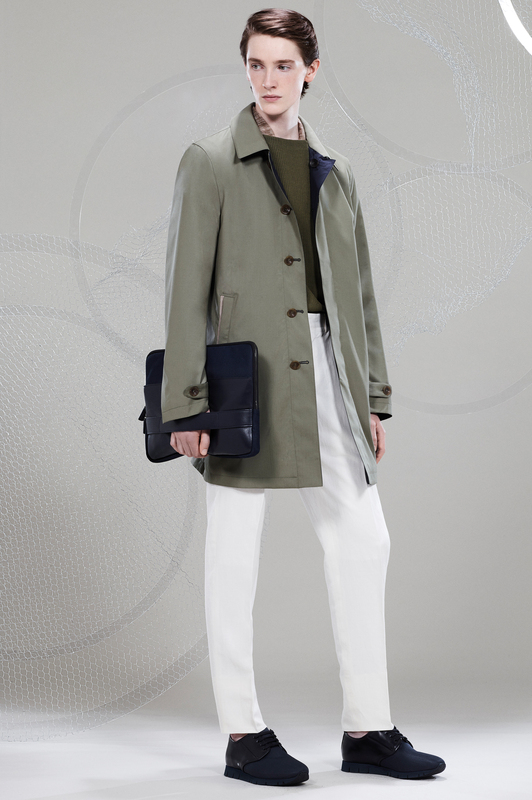 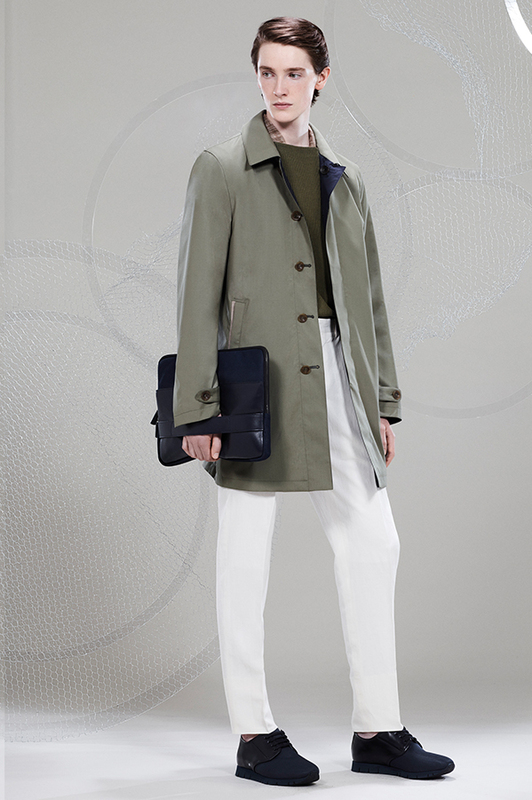 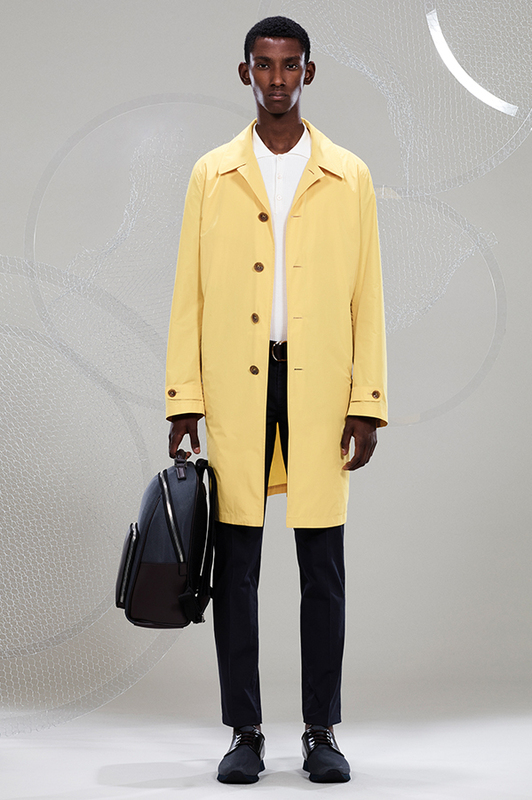 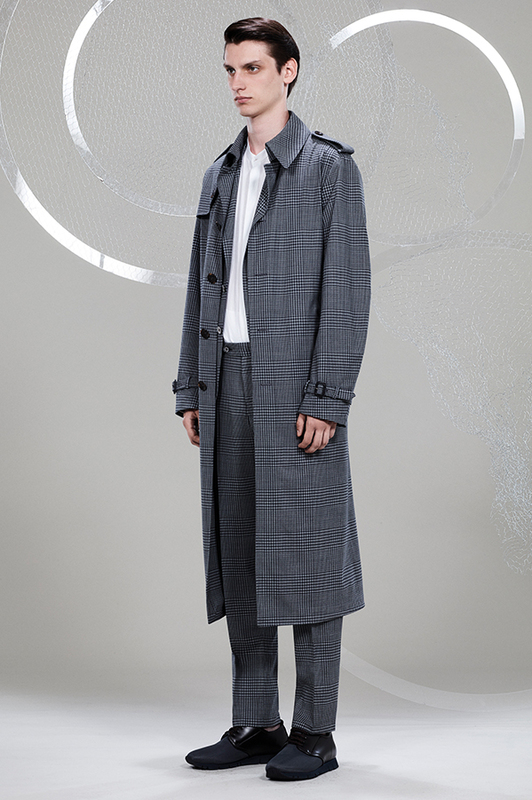 Pure wool Impeccabile 2.0 trench coat in Rain and Wind fabric, Impeccabile 2.0 suit with Prince of Wales check, flat-front pants, linen collarless overshirt with pockets, sneakers in calfskin and technical fabric. Pure wool Impeccabile 2.0 sport coat in Rain and Wind fabric, Impeccabile 2.0 Kei two-button blazer and flat-front pants, linen collarless overshirt with pockets, calfskin and technical fabric sneakers and backpack with two straps and Canali monogram, two-tone name tag. 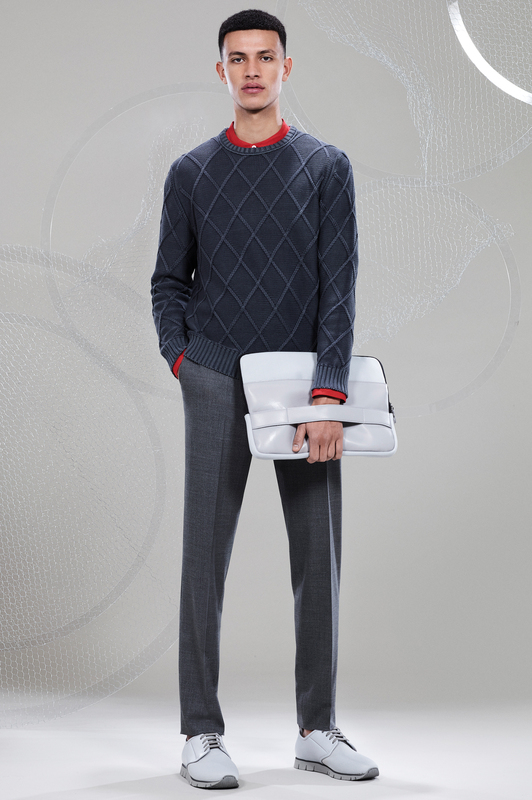 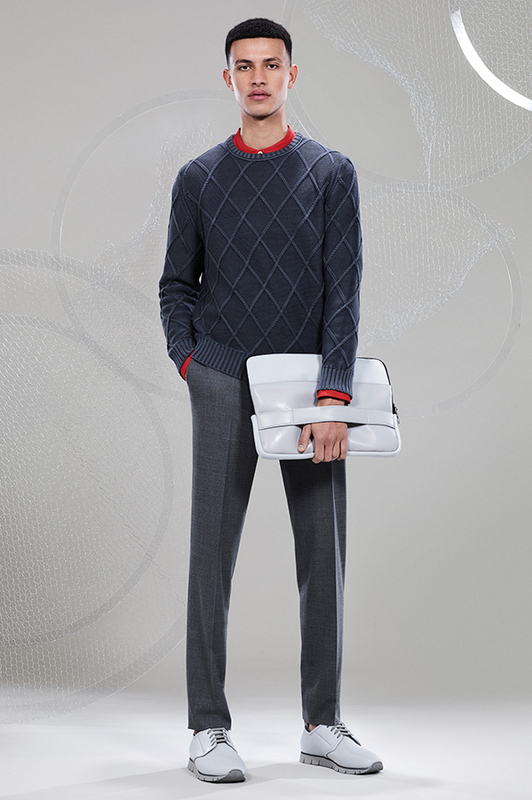 Cotton crew neck sweater with diamond motif, linen collarless overshirt with pockets, pure wool Impeccabile 2.0 flat-front pants, calfskin and technical fabric sneakers, calfskin and technical fabric document holder with Canali monogram. 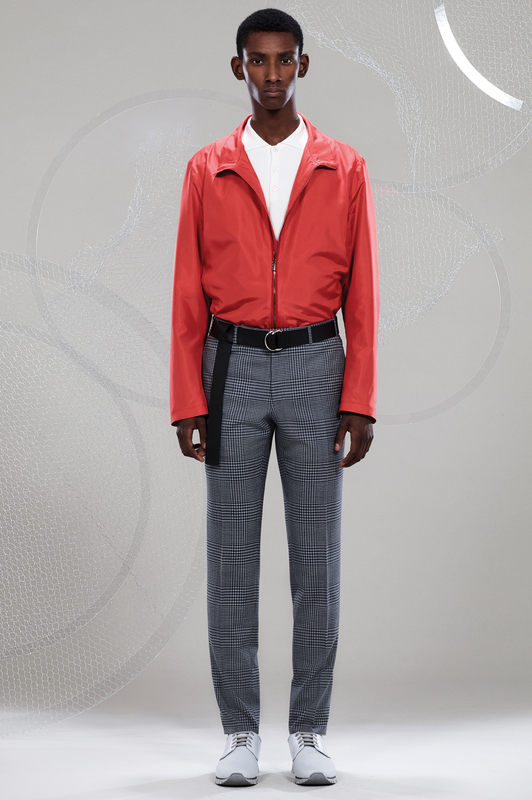 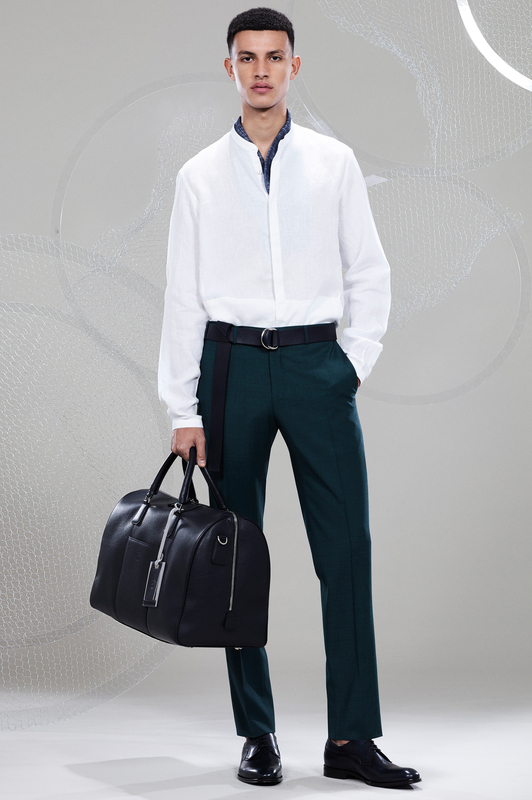 Unlined Exclusive silk jacket with stand-up collar and suede inserts, cotton knit polo with vertical ribbing, pure wool Impeccabile 2.0 Kei flat-front pants with macro Prince of Wales check, long calfskin belt with double rings, calfskin and technical fabric sneakers. 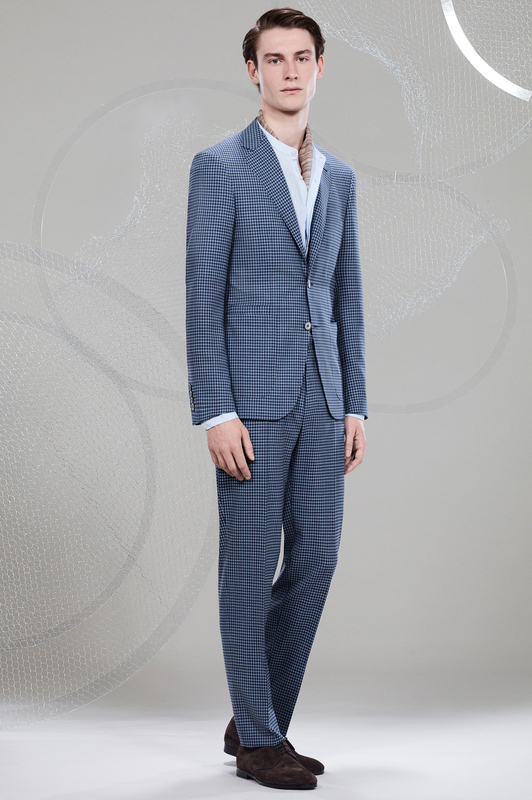 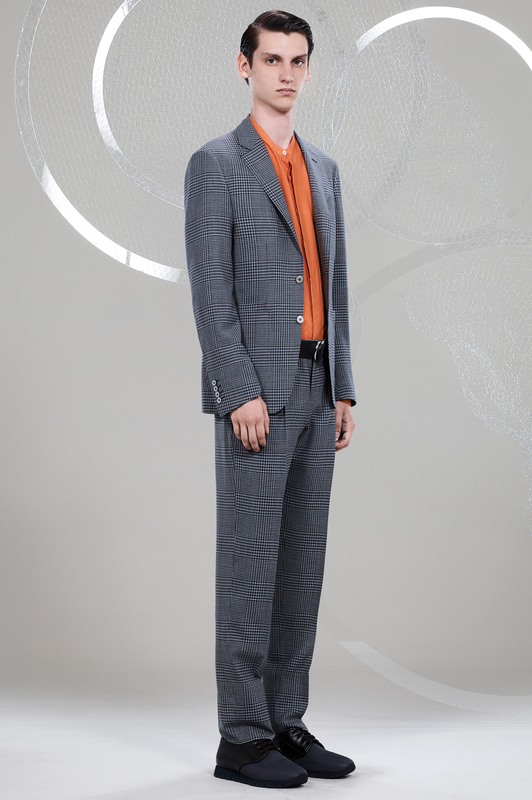 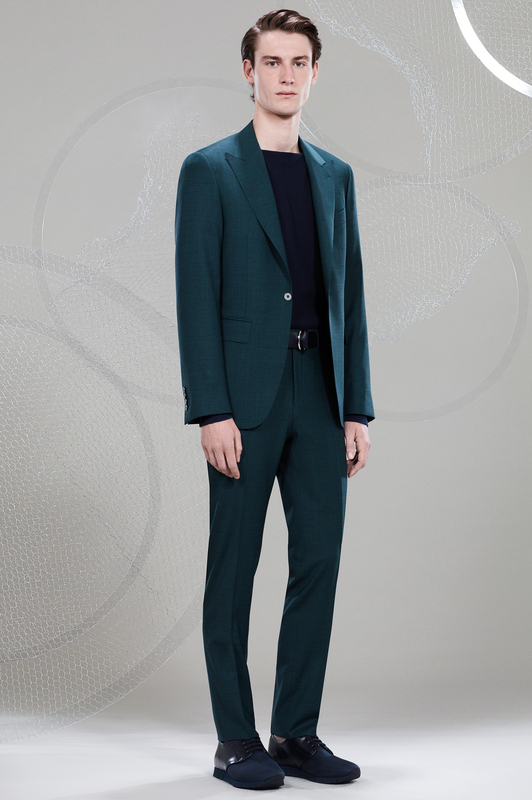 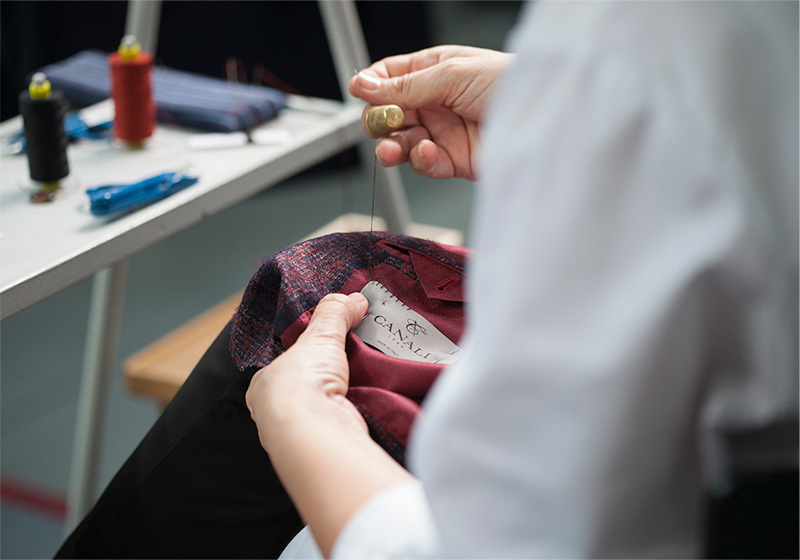 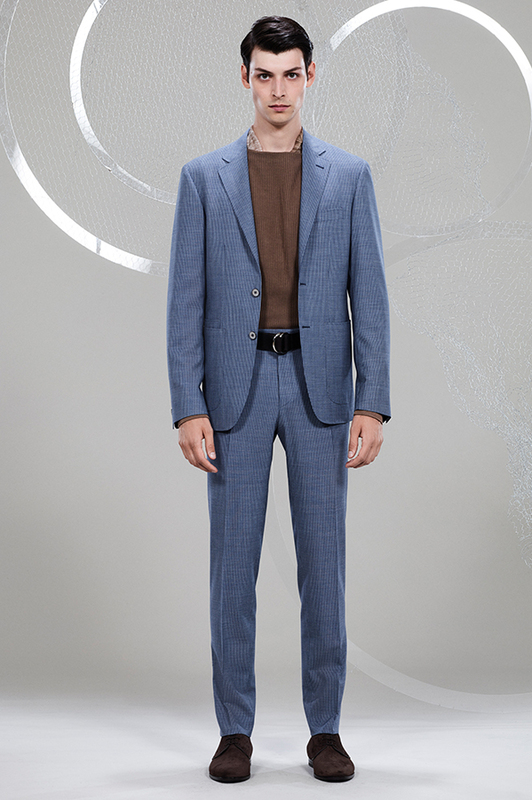 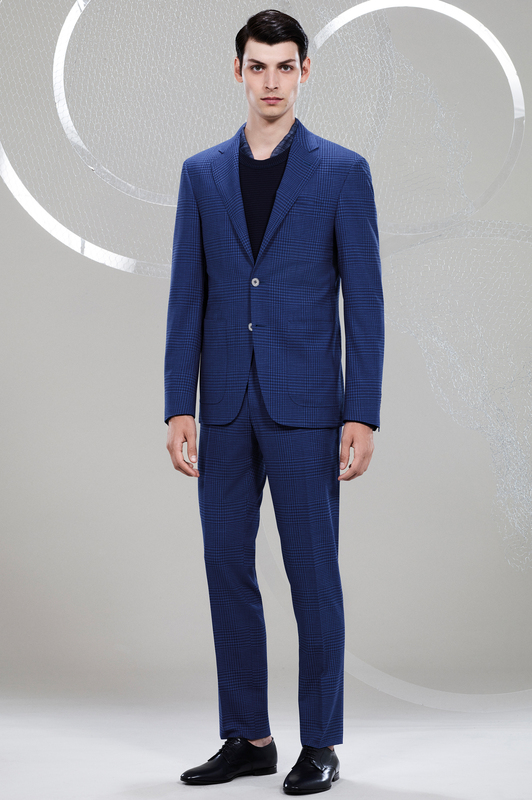 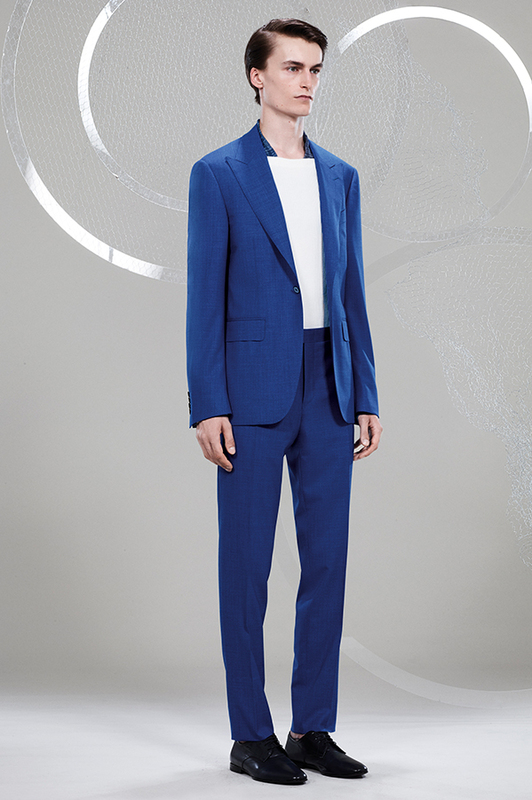 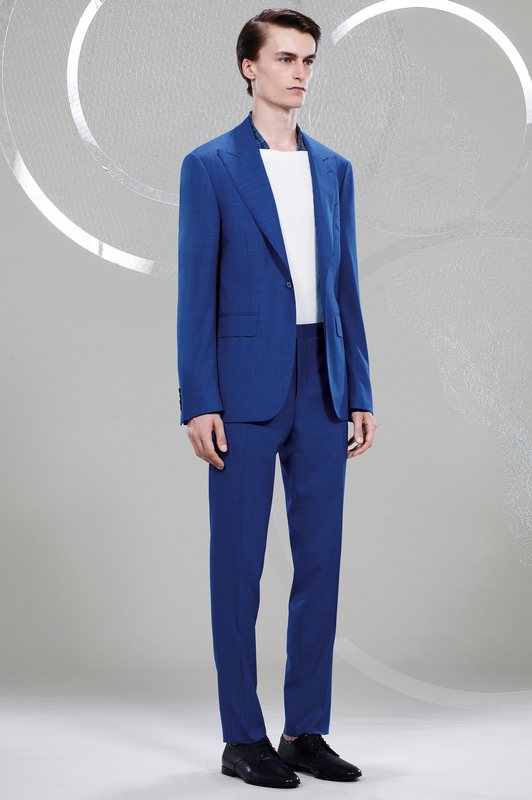 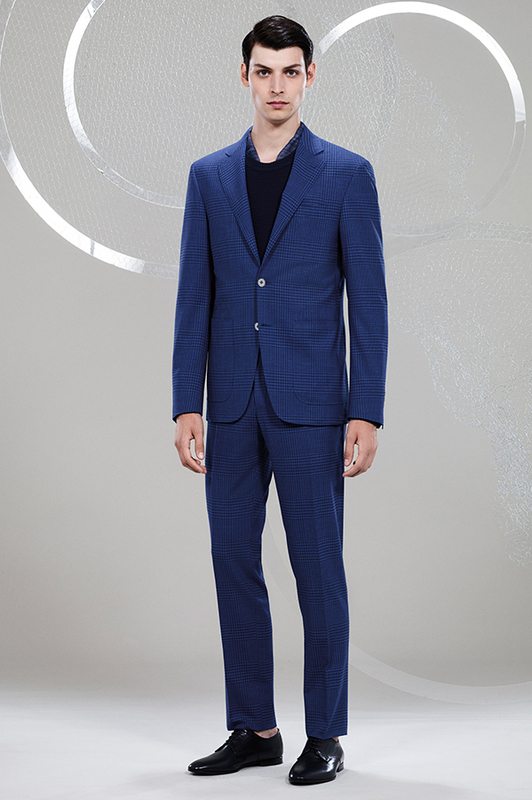 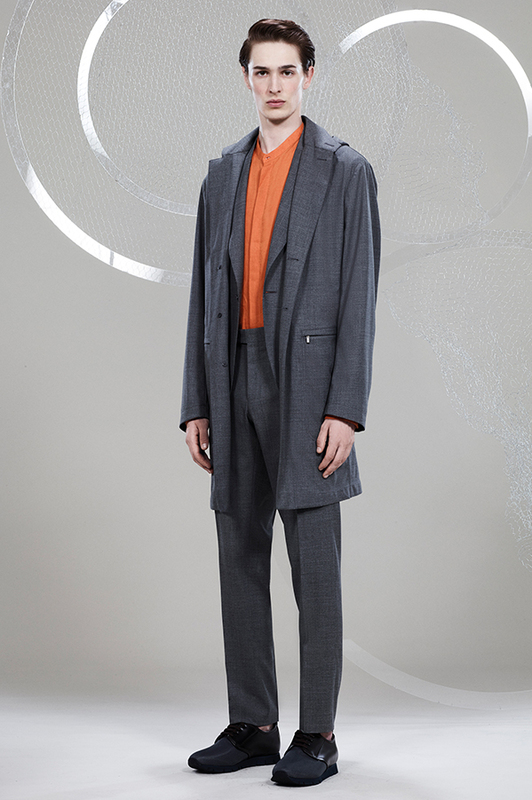 Wool suit consisting of one-button blazer with peak lapels, flat-front pants, cotton sweater with vertical ribbing and trapeze collar, long calfskin belt with double rings, calfskin and technical fabric sneakers. 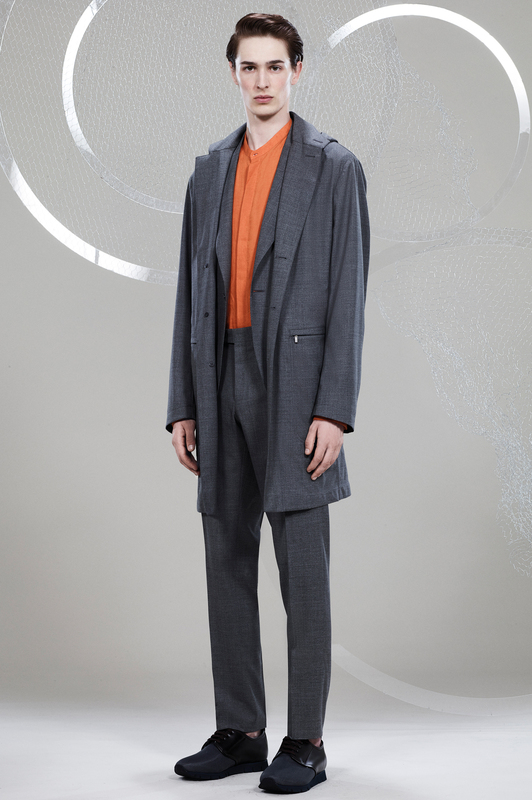 Pure wool Impeccabile 2.0 sport coat in Rain and Wind fabric with removable hood, Impeccabile 2.0 blazer with one button and peak lapels, flat-front Kei pants, linen collarless overshirt with pockets, calfskin and technical sneakers. 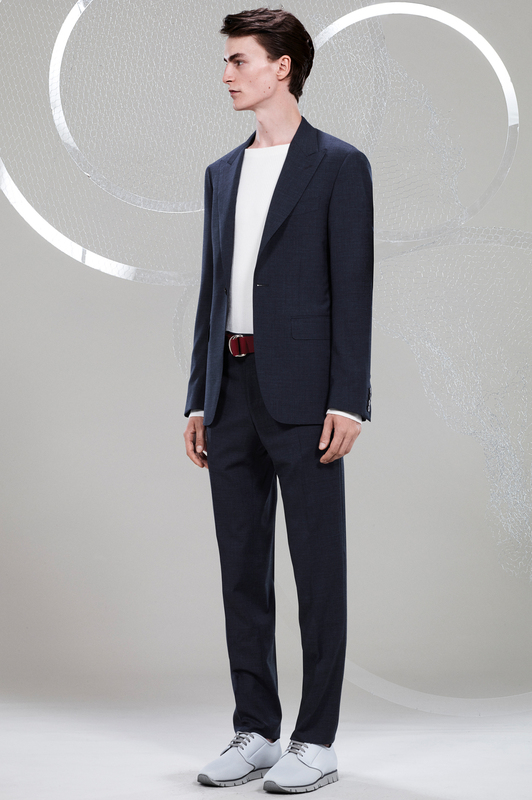 Pure wool Impeccabile 2.0 Kei blazer with macro Prince of Wales check, double-pleated pants, linen collarless overshirt with pockets, long calfskin belt with double rings, calfskin and technical fabric sneakers. 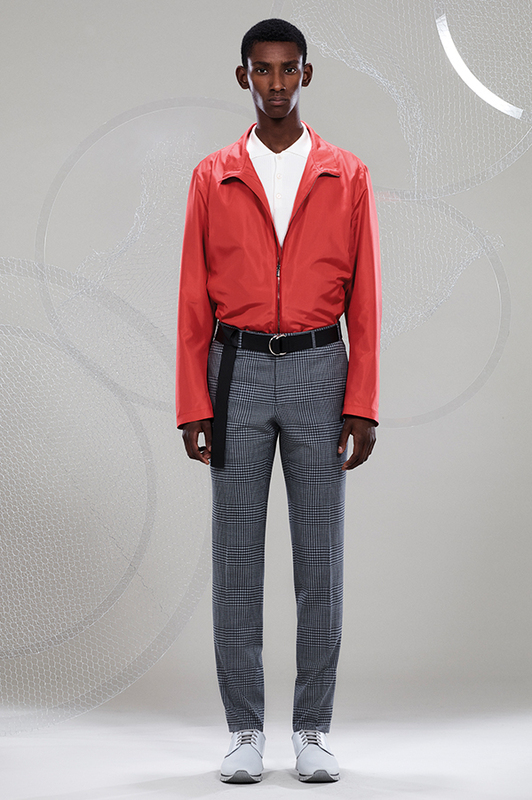 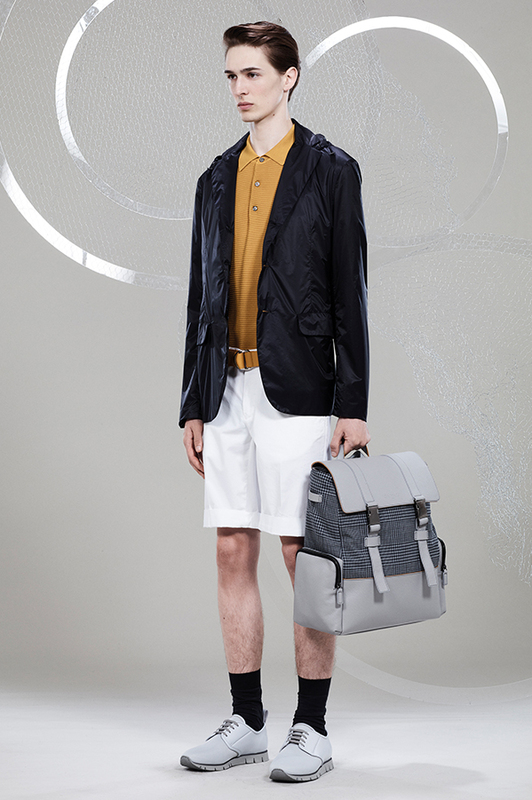 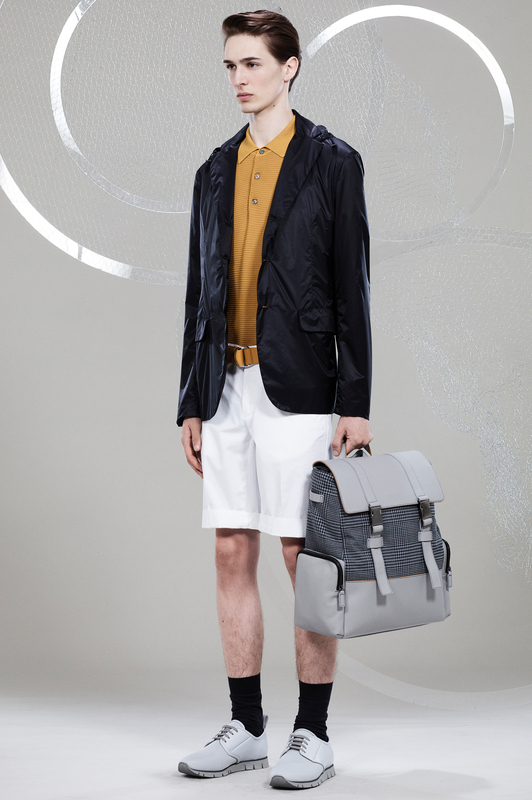 Casual fold-away rain jacket with removable hood, cotton knit polo with horizontal ribbing, flat-front cotton shorts, long calfskin belt with double rings, calfskin and technical fabric sneakers, backpack with two belts and side pockets in tumbled calfskin and Impeccabile 2.0 fabric. 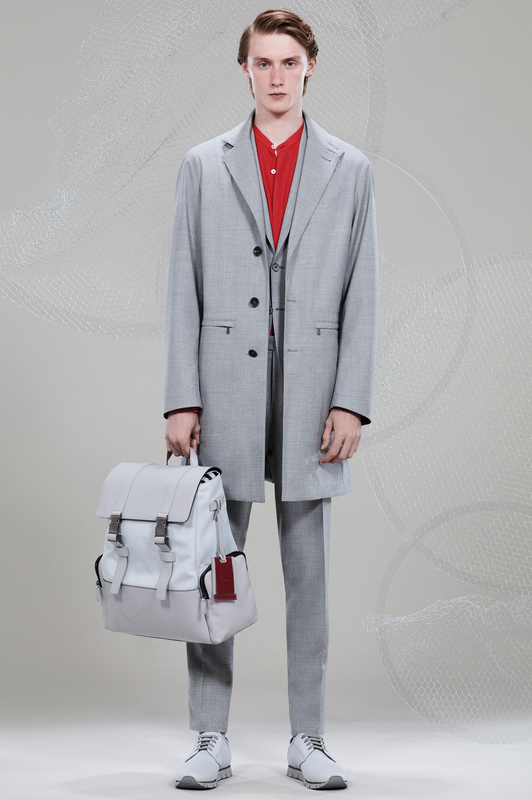 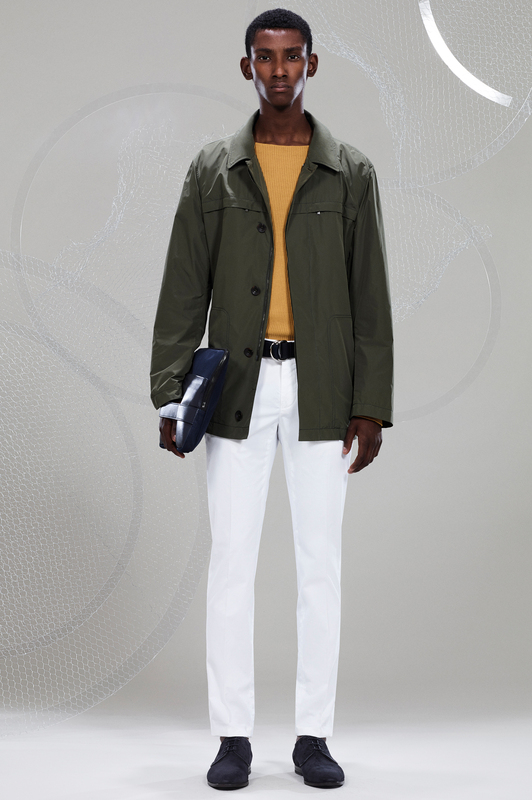 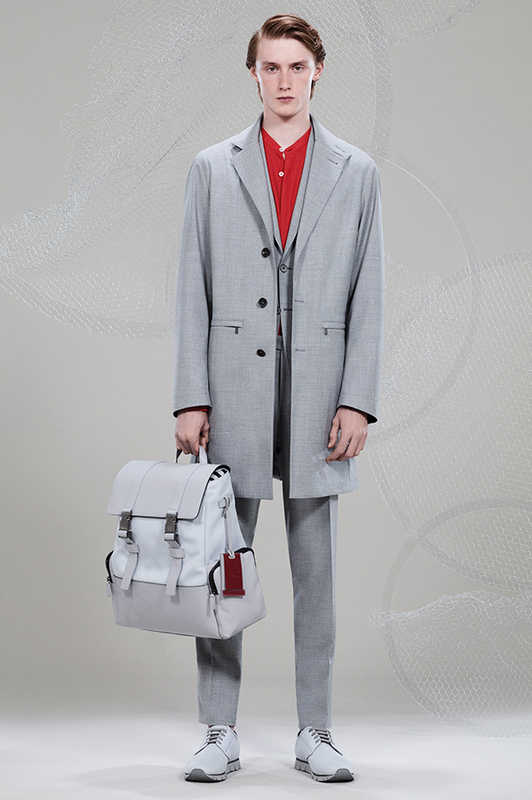 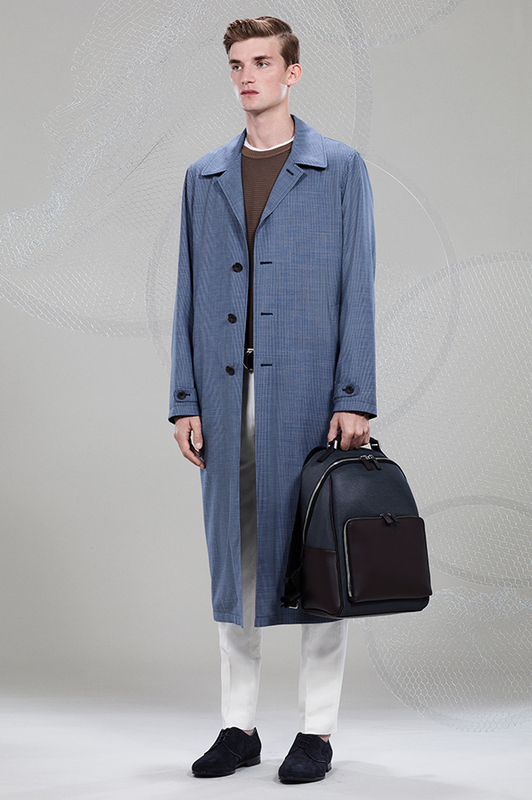 Reversible 150s wool rain coat with suede details, cotton sweater with vertical ribbing and trapeze collar, linen-silk double-pleated pants, cotton-linen scarf, calfskin and technical fabric sneakers and document holder with Canali monogram. 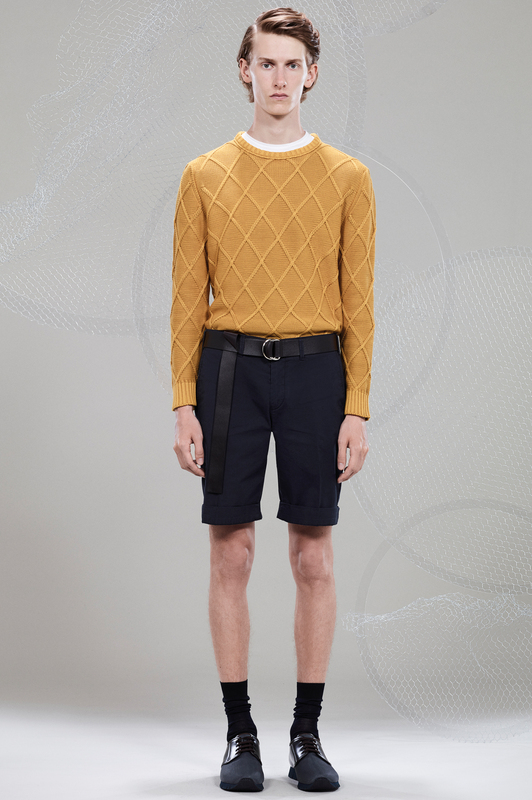 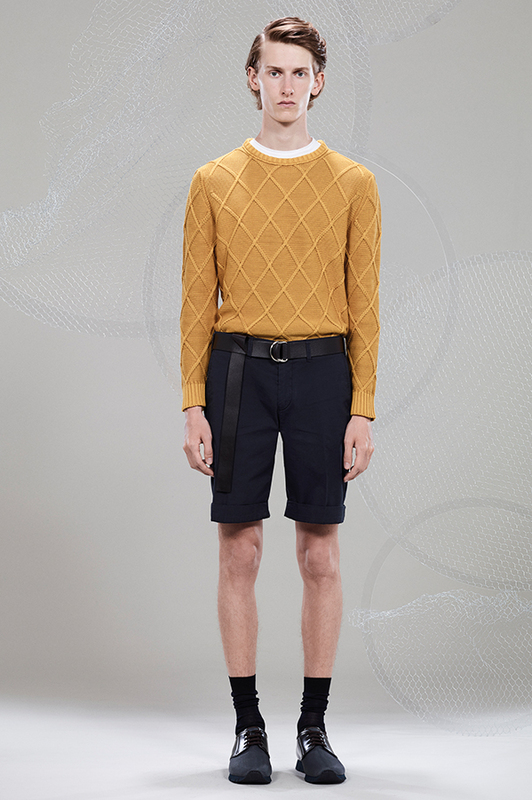 Cotton crew neck sweater with diamond texture, mercerized cotton T-shirt, flat-front cotton stretch shorts, long calfskin belt with double rings, calfskin and technical fabric sneakers. 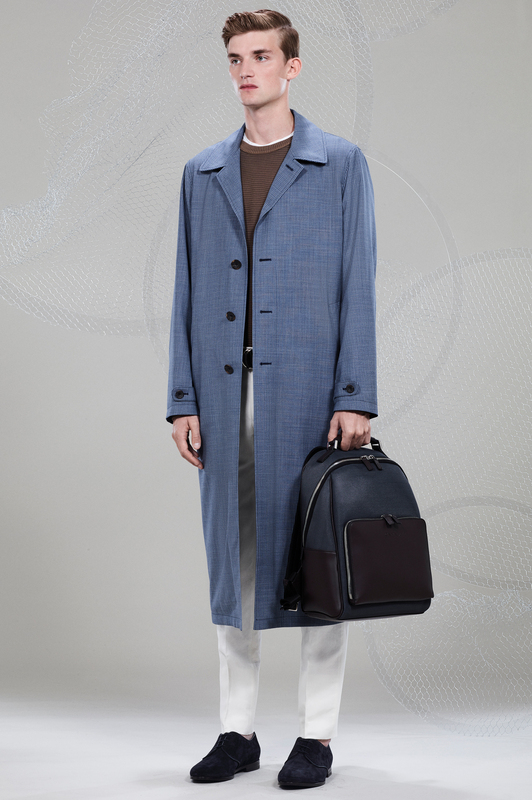 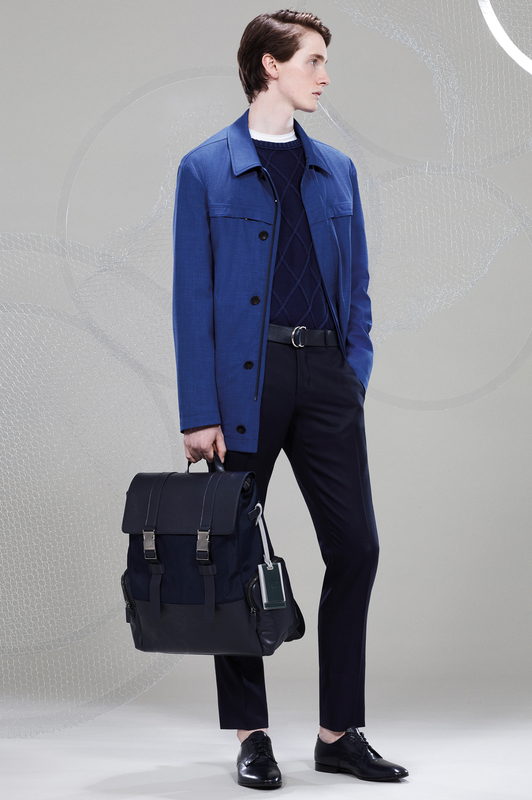 Water-proof coat with removable hood, cotton sweater with vertical ribbing and trapeze collar, cotton stretch chino pants, long calfskin belt with double rings, suede Derby shoes, calfskin and technical fabric document holder with Canali monogram. 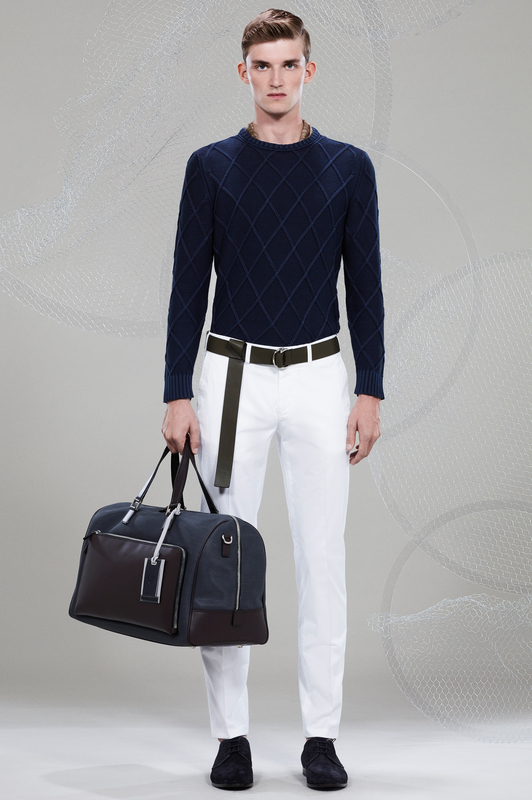 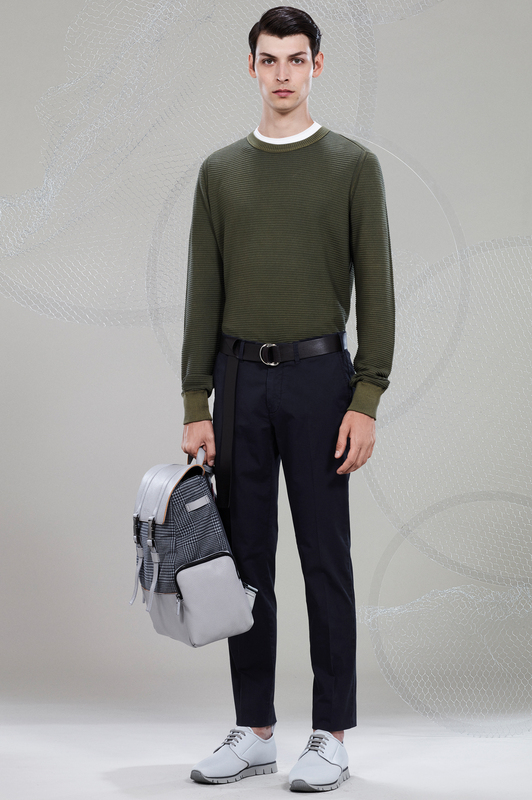 Cotton crew neck sweater with horizontal ribbing, mercerized cotton T-shirt, cotton stretch chino pants, long calfskin belt with double rings, calfskin and technical fabric sneakers, backpack with two belts and side pockets in tumbled calfskin and Impeccabile 2.0 fabric. 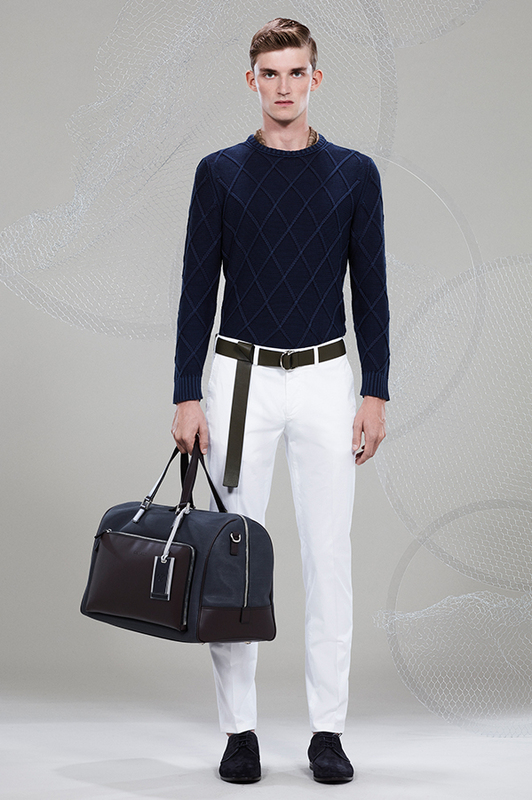 Cotton crew neck sweater with diamond motif, cotton stretch chino pants, long calfskin belt with double rings, suede Derby shoes, cotton-linen scarf with texture, calfskin and technical fabric weekender, two-tone name tag. 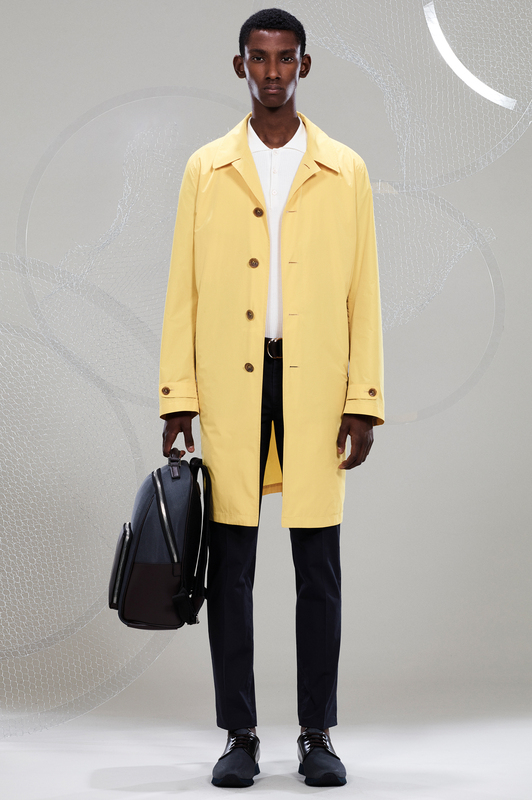 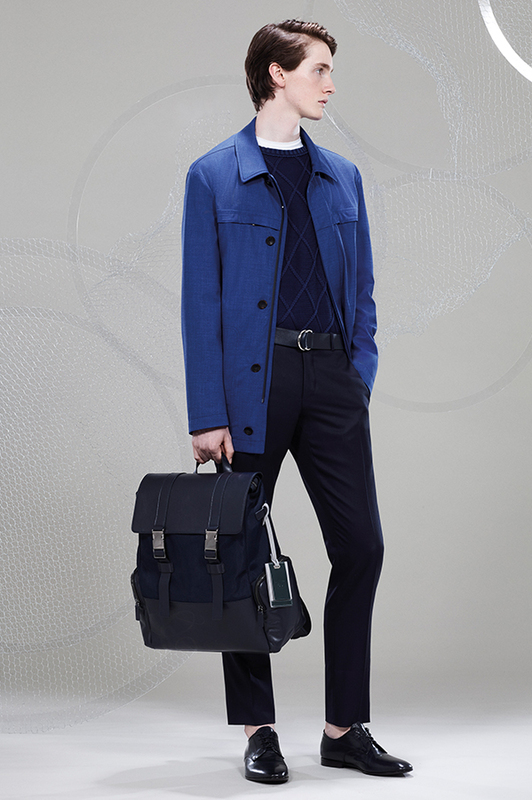 Water-proof rain semi-lined rain coat, cotton knit polo shirt with vertical ribbing, cotton stretch chino pants, long calfskin belts with double rings, calfskin and technical fabric sneakers, backpack with zip and front pocket in calfskin and technical fabric. 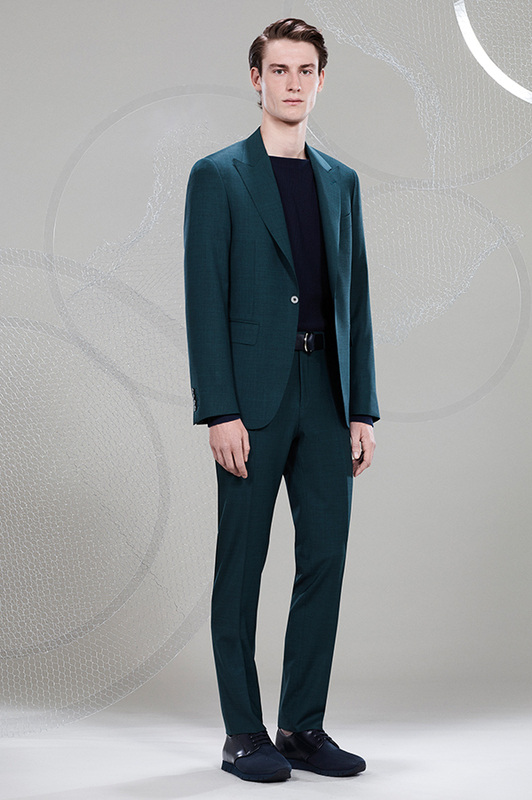 Natural comfort wool blazer with one button and peak lapels, Kei flat-front pants, cotton sweater with vertical ribbing and trapeze collar, long calfskin belt with double rings, calfskin and technical fabric sneakers. 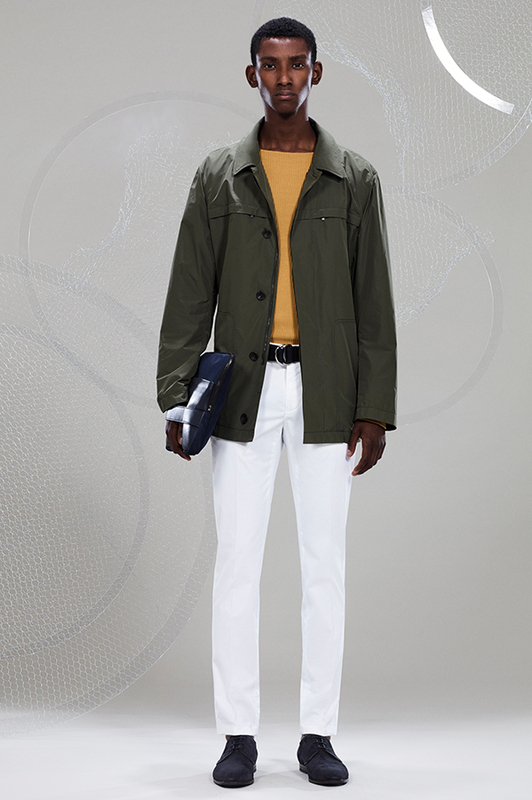 Linen collarless overshirt with pockets, natural comfort wool flat-front pants, cotton-linen scarf with texture, calfskin Derby shoes with medallion, tumbled calfskin weekender, two-tone name tag with Canali logo. 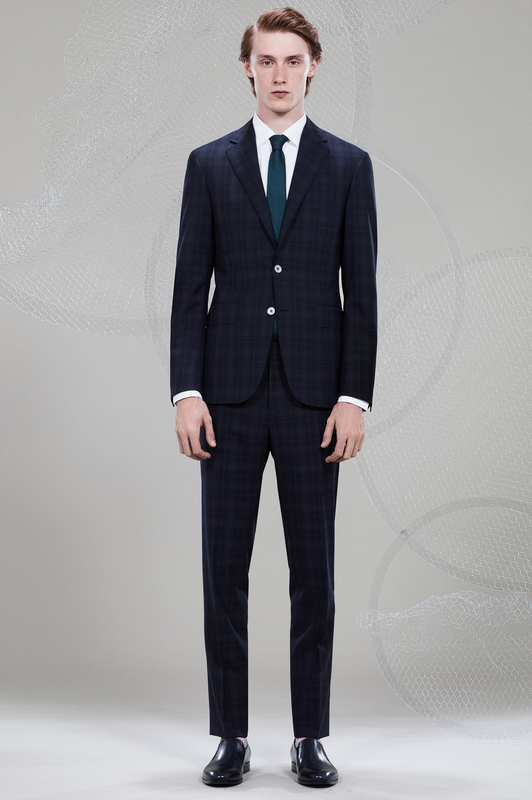 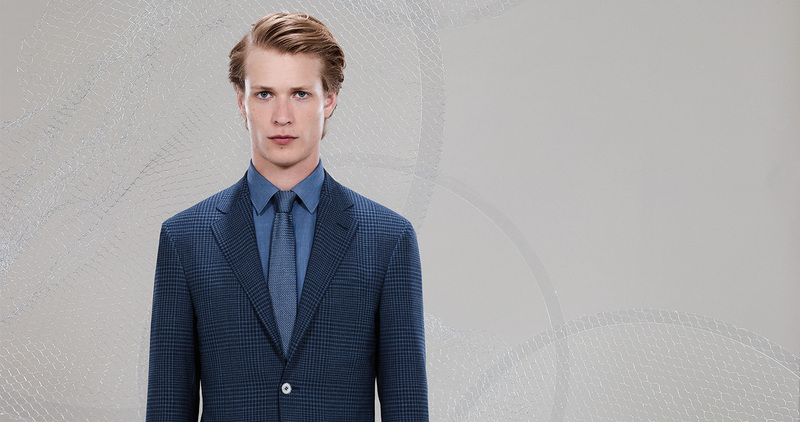 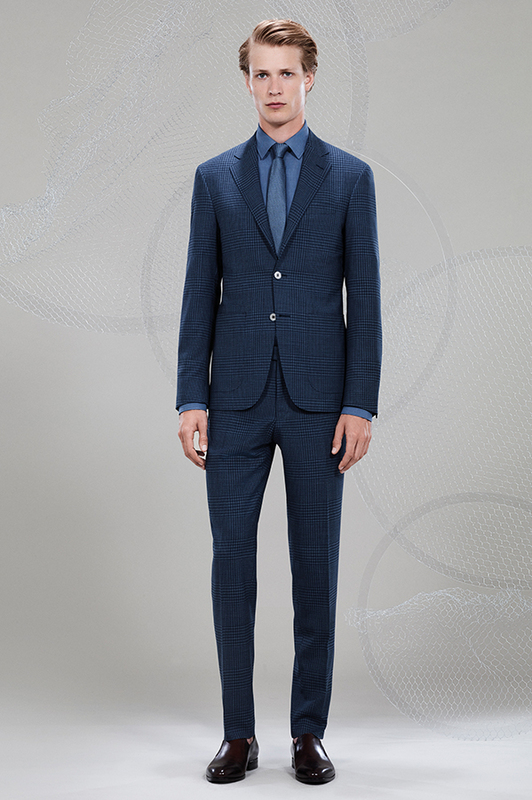 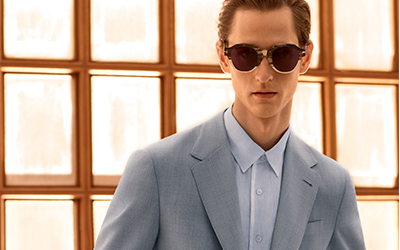 Pure wool Impeccabile Kei suit with Prince of Wales check consisting of two-button blazer and flat-front pants, Impeccabile cotton dress shirt with small collar, unlined silk tie with contrasting stitches, calfskin loafers with medallion. 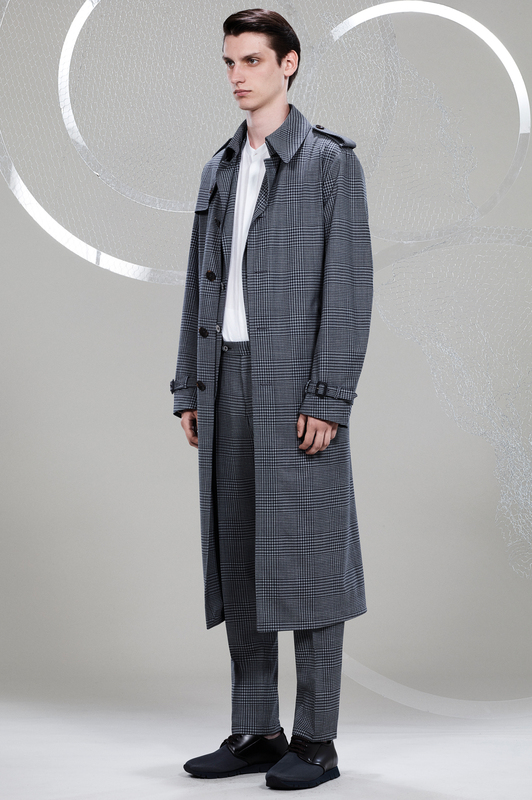 Unlined pure wool Impeccabile 2.0 water-proof trench, linen collarless overshirt with pockets, Impeccabile 2.0 flat-front pants, cotton-linen scarf with textured print, calfskin loafers with medallion. 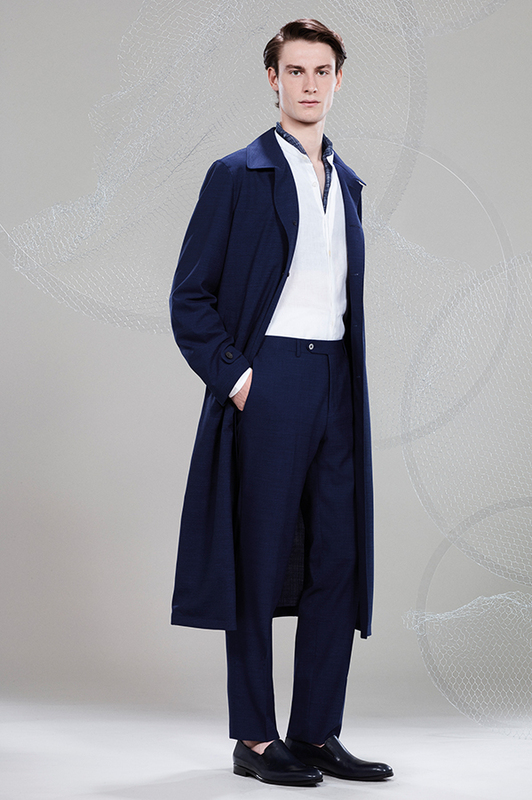 Pure wool Impeccabile 2.0 blazer with one button and peak lapels, flat-front Kei pants, cotton sweater with vertical ribbing and trapeze collar, cotton-linen scarf with texture, kangaroo leather Derby shoes. 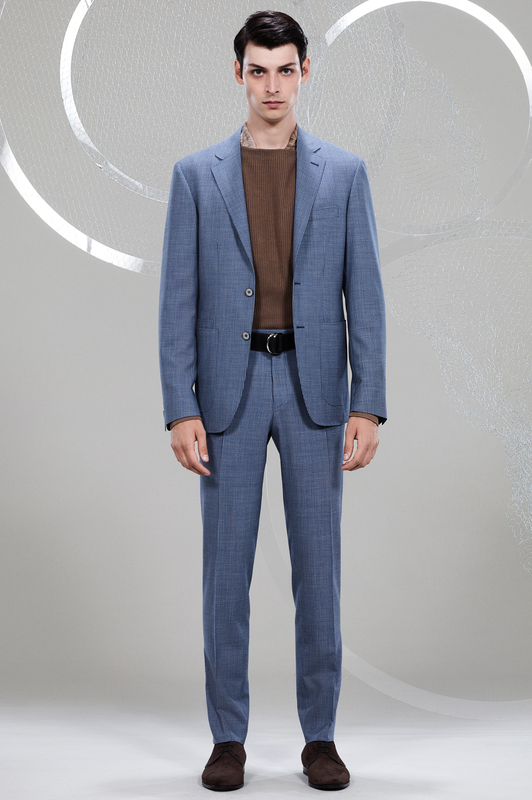 Pure wool Impeccabile 2.0 Kei suit with macro Prince of Wales check consisting of two-button blazer and flat-front pants, cotton crew neck sweater with horizontal ribbing, cotton-linen scarf with denim effect, kangaroo leather Derby shoes. 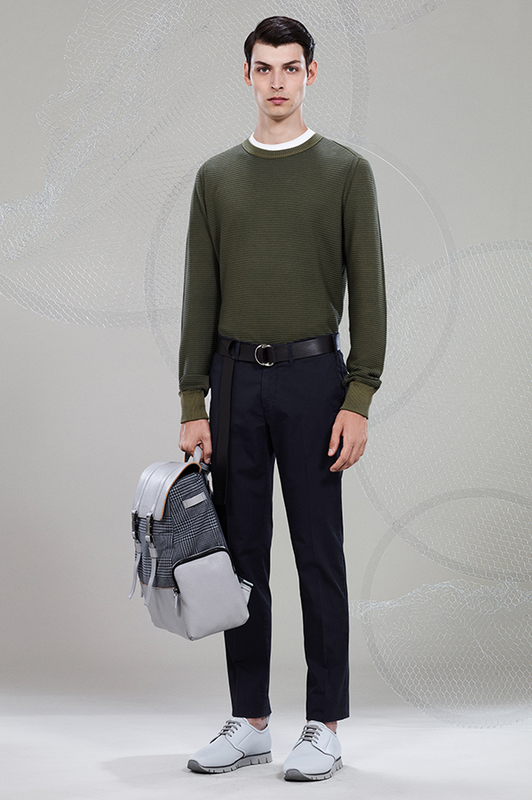 Pure wool Impeccabile 2.0 short coat with removable hood in Rain and Wind fabric, cotton crew neck sweater with diamond motif, mercerized cotton T-shirt, pure wool flat-front pants, calfskin and technical fabric backpack with two belts and Canali monogram, long calfskin belt with double rings, kangaroo leather Derby shoes.